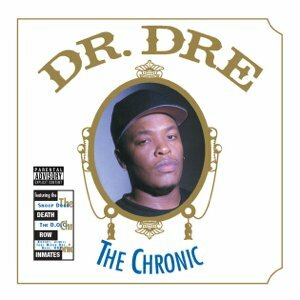 “The Chronic is the debut studio album by American hip hop recording artist Dr. Dre. It was released on December 15, 1992, by his own record label Death Row Records and distributed by Interscope Records and Priority Records. Recording sessions for the album took place in June 1992 at Death Row Studios in Los Angeles and at Bernie Grundman Mastering in Hollywood. The album is named after a slang term for high-grade cannabis, and its cover is a homage to Zig-Zag rolling papers. It was Dr. Dre’s first solo album after he had departed from hip hop group N.W.A and its label Ruthless Records over a financial dispute. On The Chronic, he included both subtle and direct insults at Ruthless and its owner, former N.W.A member Eazy-E. Although a solo album, it features many appearances by Snoop Dogg, who used the album as a launch pad for his own solo career. - Listen to DJ Matman’s 25th Anniversary Mixtape. - The album comes in at #1 in Ego Trip’s Top 25 Rap Albums of 1992. - The singles ‘Nuthin’ But A G Thang’ and ‘Dre Day’ come in at #1 and #9 on Ego Trip’s Top 40 Rap Singles of 1992. - The track ‘Let Me Ride’ appears on our 1992 Rap Megamix. - Listen to samples used in the making of the album on WhoSampled.